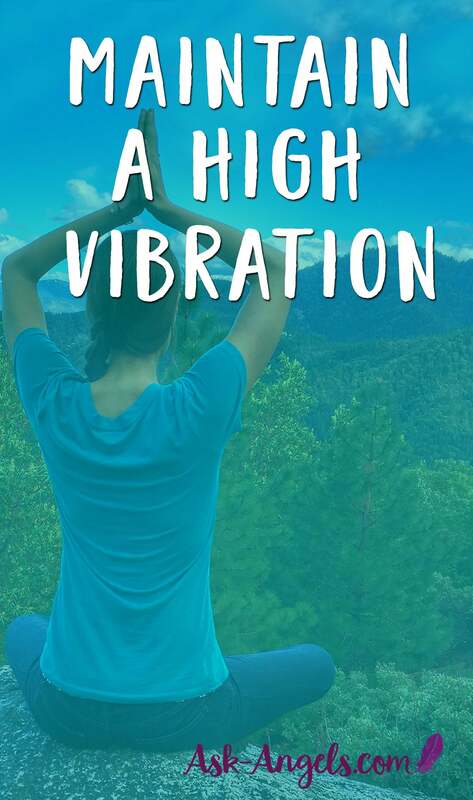 How do you maintain a high vibration? A question I've been getting recently involves vibration. And specifically, how to maintain a high level of vibration. Honestly, the simplest answer to the question is this: To maintain a high vibration, keep raising it. Raise your vibration to a new level of light by integrating your lessons, meditating daily, exercising, eating healthy, and releasing fear and lower levels of energy. Do the things that support you in raising your vibration on a consistent basis. This is how you begin to live with a greater level of harmony and joy and bliss. This is how you maintain your vibration! Learn more about how to raise your vibration here. I talk a lot about raising our vibration, and if you've been joining me in the guided Angel meditations, you're experiencing incredible levels of love, light, and pure connection with Divine source. This is oneness energy; that amazing Christ light consciousness and the ascended state. But then you come back from meditation and you have to go to work. You have to deal with a coworker or a family member or juggle ten things at once. It’s come my attention recently that many of you are really feeling this drop-off and wondering how to retain that higher level of consciousness in every moment. I want to point out that what you’re going through is completely normal. We live in the physical realm and there are many challenges. There is duality, there is chaotic energy, and there is the energy of others. For tens of thousands of years the earth has been going in this direction and now, you and I are here to anchor the light. And we are doing it. We are changing this paradigm. Then this becomes what you are creating. But if you pause and notice “I’m feeling some heavy energy,” you don’t have to take it on as a reflection of who you are. Just let it be normal. “Okay, I’m experiencing some density.” You can then move through it. You can consciously release the pain, fear, or past energy that’s coming up in you. Maybe you’re a transmuter and you’re experiencing this lower vibrational energy coming up from the collective consciousness. You have an awareness of “I am feeling something other than my authentic state of love, light, and joy.” Once you know this, you can then release it. You can allow it to move through you, rather than latching onto you. A huge part of retaining the higher levels of vibration you're tuning into, involves awareness, and being able and willing to shift when older patterns, beliefs or densities kick in. Recognize and be aware that when lower energy appears, when you feel that drop in your vibration, that this is no reflection of your authentic state. Have awareness and know what you need to do in order to shift. For me, a salt bath or a walk in nature works wonders. I know other people who like to go for a run or sit in the steam room. What do you need to do? Put on music and dance around your living room? Maybe clean your house? Take a shower? Do what you need to do to shift the energy. Simply recognize that it's not a reflection of your vibrational state for you to feel a bit off. Pay attention to what information you've been ingesting. Have you been scrolling through the Facebook timeline? That is a surefire way to lower your vibration. Get out in nature to recharge and reset. What have you been eating? Are you eating high vibrationally? Are you eating raw fruits and vegetables filled with life force energy or are you eating heavy processed food and meat filled with pain energy that’s lowering your field and allowing you to become susceptible to negativity? Are others latching onto you energetically with cords? Are you allowing someone else to drain your energy so that you feel exhausted, worn out, and irritable? Ask Archangel Michael to cut the cords that are draining you and become aware of your ability to return to love. So here's the thing. The very idea of “maintaining your vibration” is flawed because you cannot stay the same. In this world we live in, there's no standing still. Change is a constant. You might have heard the phrase, “If you're not growing, you’re dying.” While this may sound harsh, in a vibrational sense, it is true. 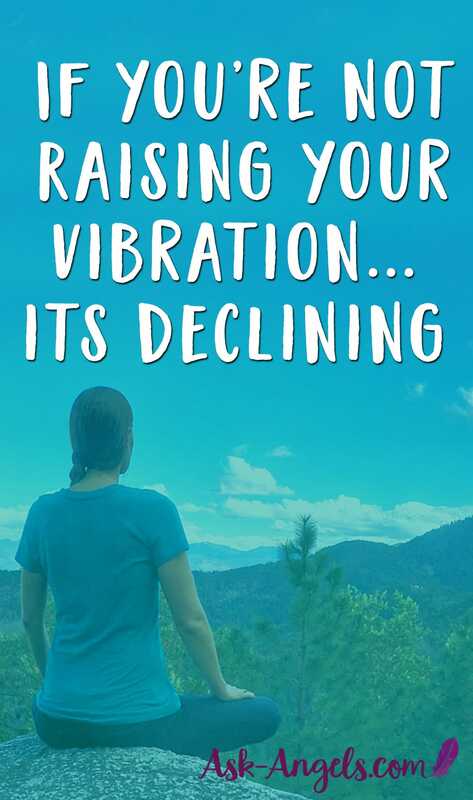 If you are not actively raising your vibration, your vibration is declining. The present moment is your opportunity to choose love, to light up your being, and to lift to a new level of light. This includes the moments where you feel challenged. If you feel weighed down by negativity, recognize that your job in that moment is to shift. A great way to refocus your energy and awareness on love, that balances and harmonizes your mind, body and spirit, is called coherence. Close your eyes. Breathe. Tune into the light of your heart. Ask your Angels for help. “Angels, help me to open my heart.” Let your heart light expand. If you're having trouble opening your heart, think about a place or person you love. Think about the word “love.” What does love invoke in you? Tune into love, breathe in love, exhale love and let your heart light expand. Let your ascension column light up, uniting all seven chakras of your physical being (and so many more chakras above seven). Light up eight through twelve and beyond, light up all of your chakras in this ascension pillar of light and let your aura expand around you. Imagine that you have a dial that represents your level of light and turn that dial all the way up. This way, you shine brighter, more radiantly, and with more love. And remember to keep elevating your vibration. What you put into your body directly affects your vibration! Learn more about what a high vibrational diet is and how to align with one here! Your every thought, belief, choice, and action is playing a role on your personal energy signature. This impacts how high you are vibrating. Take the time to meditate and take control over the ego mind. Do your inner work to continue to evolve, grow, and return to the full knowing of the Divine spiritual being that you are. Stand in your authentic light and truth and then let it be okay if you have an off day. Let it be okay if you're feeling energy. Don’t take that on as an indication of your failure or of not being worthy. Rather, let it be what it is: a temporary experience of a lower vibration. When you are able to objectively view it in this way, you take your power back from it. You don’t need to be lowered down in vibration because of it. Rather, you're able to be aware, “I’m experiencing negative emotion, and this is not me.” Because the truth of who you are is vibrant; is Divine. If you’re experiencing lower negativity, doubt, and resistance, recognize that it's not you and do what you need to do to shift. Shift your energy and one moment at a time, return to this focus of love, growth, and raising your vibration. I want you to know that even if you're vibrating at an incredibly high rate already… There is always further. We live in a time in which there is incredible potential for us to realign with the higher realms and levels of love and light. Even the Ascended Masters continue to evolve and grow and raise their vibration. They’re continually getting promotions as they step into new levels of light, take on new responsibilities, and ways of being of service. So are you and I. Have compassion for yourself through this process. Remember that you’re an infinite spiritual being, a Divine being in a limited physical form. You’re surrounded by all kinds of negativity, dense energy, and challenging experiences and people. It’s okay. You are here to help usher in the new age and the new paradigm of love, peace, and greater harmony on earth. But even in a fully ascended state, you experience challenges. You are able to choose how you respond to the challenge. When you choose to not take it personally, to respond with love, and do what you need to do to shift, you learn the lesson. Instead of being weighed down by a challenge, instead of being adversely affected by feelings and negativity, claim your power from it. You’ll actually raise your vibration higher. When in doubt, take action. When feeling low energy and heavy, get moving. Go for a hike, work out, do some push-ups, jump around your living room. Do what you need to do to shift. You are so supported by the entire realm of light, by the Angels, by the Ascended Masters, by your personal team. They are all encouraging you in every moment. So, if you feel alone, ask for signs of their presence. If you feel lost, ask for guidance. If you feel like you just can't shift your energy, call in Archangel Michael. Ask Archangel Michael to cut any and all cords of attachment draining your energy. Ask for him to vacuum your energy of fear, negativity, and density… And he will! You can also call upon your guardian angels to help balance and harmonize your being, Archangel Raphael for healing, or Archangel Uriel to light up your life with the flame of truth. Remember that light, love, and joy are infinitely more powerful than any darkness, fear, or negativity. Greet the negative with the positive, greet fear with love, and greet darkness with light. Do this and you will shine brighter, you will raise your vibration, and step into more of the brilliant authentic truth of the Divine being in physical form that you authentically are. Raising your vibration, and aligning with your full light and authenticity is how you open to a new level of abundance, clarity, certainty, and self-love. This is how you not only align with fulfillment, joy, love, and harmony in your life, but this is how you step into your role as a way-shower for humanity. This is how you step into your role, ushering in the positive change and the return to greater love, light, and balance on earth. There are so many people in the world who need help now. Get out of doubt and get into action, letting love guide you, knowing that you’re supported and knowing that all is well. You are beautiful. You are a Divine light being. Return to that knowing and return to that energetic presence. Let your torus light body fill with light and expand. And beautiful brothers and sisters in light, let your light shine. It is needed in the world. We, together as a light family, as a team, can usher in this positive change for all. Keep letting your light shine because this is who you really are. You are authentically, a vibrant spiritual being in physical form. The more you consciously strive to shine, love, and choose joy, the more effortless, fulfilling, and rewarding it becomes. One step at a time, shine on! Archangel Michael Yoga? Exploring Michaelic or Cognitive Yoga! What Is Ascension? What Does “Ascension” Really Mean? Thank you Melanie, that was really nice.